Iberia holds a leading market position in the Europe to Latin America market, but other European legacy carriers are adding capacity in this emerging market and are nibbling at Iberia’s share of the pie. 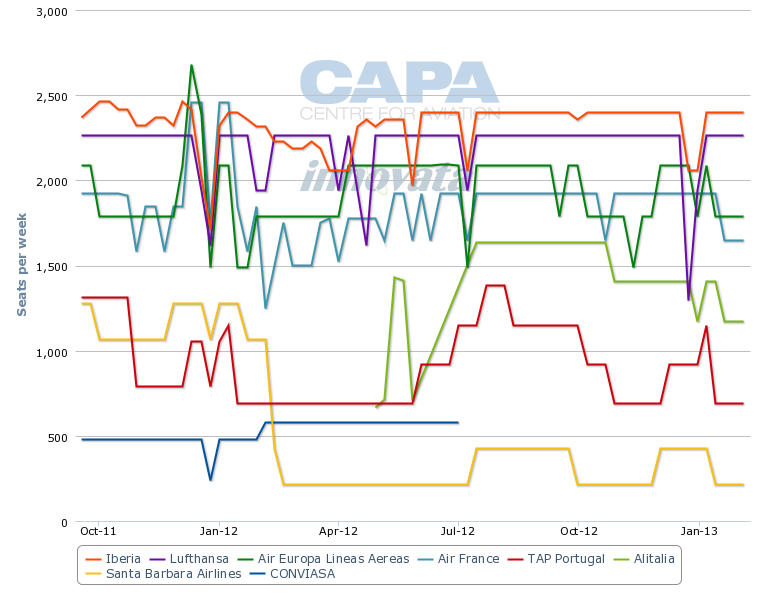 Demand in the Spanish market for Latin American routes is still strong yet weakening owing to the persistent euro debt worries and contraction of the country’s economy while Iberia is struggling to keep unit cost under control and in-flight amenities in the back of the cabin have not kept up with current comfort and configuration standards. The pressure is mounting on the other side of the route also, with Latin American carriers developing from small regional players with a mediocre service offering into strong cross-border groups and potentially global players investing in new fleets and on board products. Iberia operates 172 weekly scheduled passengers flights between Spain and Latin America, according to schedules in Innovata for the week of 20-Aug-2012 to 26-Aug-2012. Its network spans 17 destinations in the region and weekly scheduled passenger capacity amounts to roughly 56,500 seats. This gives the Spanish airline a leading market position, but Air France is closing in with 169 weekly frequencies to 16 scheduled passenger destinations in Latin America. Air France’s presence in Latin America includes several airports in its overseas territories, which its serves with high frequency and high-density equipment. For instance, it operates twice daily from Paris to Pointe a Pitre in Guadeloupe and a twice daily to Fort de France in Martinique with 343-seat Boeing 777-300ERs. As those are French territories and are integral parts of the French Republic, Air France also operates regional flights between the different islands as well as some short-haul international flights. Historically Iberia’s long-haul operations have been profitable whereas its short and medium-haul is a big drain on the company’s performance. This is the case for most of Europe’s legacy carriers. But when speaking to analysts to discuss the 2Q2012 results, Mr Walsh conceded that IAG believes the Spanish airline’s profits in the long-haul segment have not been sufficient “to justify the long-term plans for growth there”. He pointed to a “legacy cost base and legacy operating conditions that are completely out of line with the market” and a lacklustre revenue management for the underperformance. “Our view on Iberia is that their unit revenue performance, particularly on the Latin American routes, can be improved. We think there's commercial action that they can take, revenue management action that they can take. We're looking at best practice in terms of revenue management, demonstrating some of the advantages and learnings within British Airways,” Mr Walsh said. Unit revenue on IAG’s Latin American routes has recorded a nice swing upwards so far this year. Reported RASK rose 8% year-on-year in 1Q2012 on a 2.1% increase in ASKs and increased 7.5% in 2Q22012 on a 2.2% capacity adjustment, mainly on the Iberia side, in terms of ASKs. Latin America was the region showing the highest increase in RASK within IAG. IAG’s assessment of Iberia’s performance, Mr Wash noted, is that “they've probably been overly distracted focusing on short and medium-haul, and have to some degree not had sufficient focus on the performance of their Latin American business”. Iberia reported a EUR263 million operating loss in 1H2012 and a EUR98 million deficit in 2011. IAG is undertaking a comprehensive review of Iberia and the turnaround plan will be presented to the board in Sep-2012. Latin America is Iberia’s core long-haul market. It operates about 19% off is its international capacity in terms of seats and almost 66% in terms of ASKs on routes to Latin America. Its network spans gateways in 15 countries spread out over Upper South America, Central America and Lower South America. Its currently operates one non-stop scheduled passenger flight to Latin America from Barcelona El Prat Airport to Sao Paulo Guarulhos International Airport, but the twice weekly service operated with Airbus A340-300 will end on 29-Oct-2012. Consequently, all of the airline’s non-stop passengers flights to Latin America will be concentrated at its main hub in Madrid Barajas Airport. Seven of Iberia’s ten largest routes in terms of ASKs are to/from Latin America, including its three largest routes which are to Buenos Aires, Mexico City and to Lima. The airline produces around 90 million ASKs on its Madrid-Buenos Aires route per week. Iberia offers the widest network and the most capacity on routes from Europe to Latin America; however, it does not have a dominant position in any of the largest markets. TAP Portugal remains the undisputed leader in routes connecting Brazil and Western Europe, which is the largest air transport market between Europe and Latin America with some 65,000 one-way seats, according to current Innovata data. 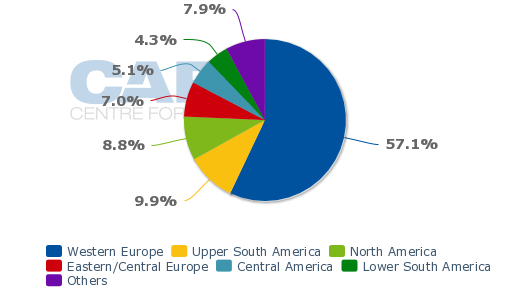 TAP has a 27% capacity share (seats) in the Europe-Brazil market, followed by LATAM Airlines Group subsidiary TAM Airlines with a 19% share and Air France's 14% share. 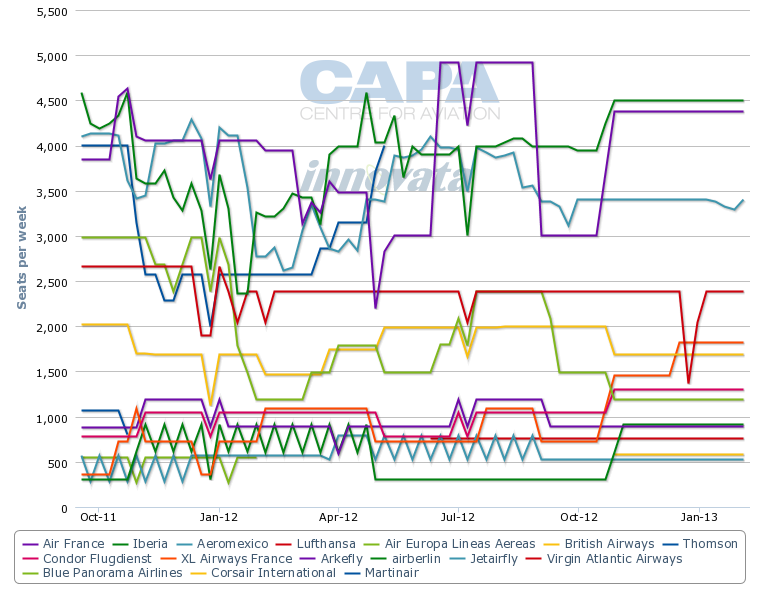 Lufthansa and Iberia round out the capacity share with an almost 9% and 8% share, respectively. Iberia serves only two gateways from Madrid in Brazil, Rio de Janeiro and Sao Paulo Guarulhos International Airport. It also flies non-stop to Sao Paulo from Barcelona, but as mentioned above, it will abandon this route from 29-Oct-2012. TAP serves 10 destinations in Portugal’s former colony. Argentina to Western Europe represents approximately 20,500 one-way seats, and Iberia is the largest capacity provider in this market with approximately 5500 seats, accounting for a 27% share in terms of seats. Aerolineas Argentinas has a 25% share of weekly seats produced while Lufthansa offers less than half of Iberia’s seat capcity on this market and has an 11% share. 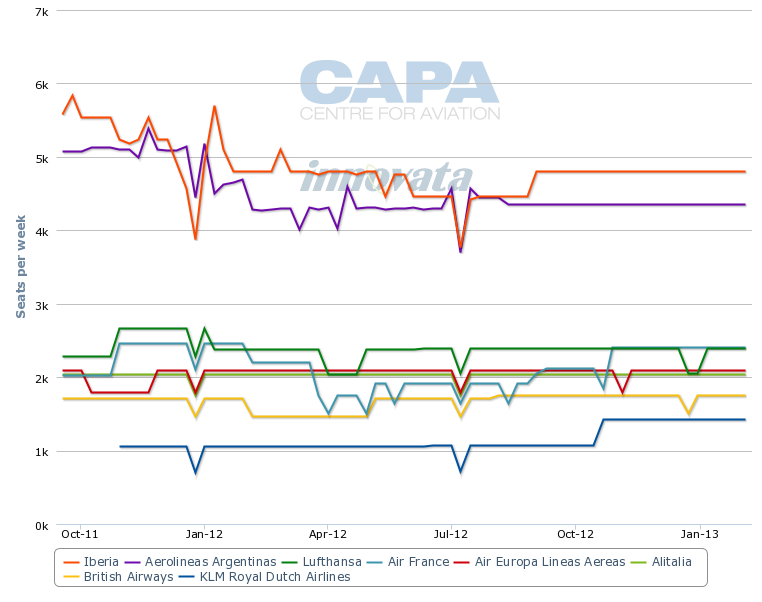 SkyTeam partners Air France and Alitalia each have a 10% share and Air Europa a 9% share. Aerolineas Argentinas was officially invited to become a member of SkyTeam in Oct-2010 and is expected to join by the end of Aug-2012. When it joins, SkyTeam will be the leading alliance in this market. KLM will add an additional frequency to its thrice weekly from Amsterdam to Buenos Aires on 28-Oct-2012. There are a very high number of airlines operating between Western Europe and Mexico as the latter is still a much-visited tourist destination for Europeans. Multiple European leisure carriers serve Mexico, including Belgium’s Jetairfly, Germany-based Condor Flugdienst, Italy’s Blue Panorama and the French carriers XL Airways and Corsair. In total, airlines produce some 24,000 one-way seats between Western Europe and Mexico. Air France offers almost 5,000 one-way seats to the country, giving it a 20% share of the wider Mexico to Western Europe market. 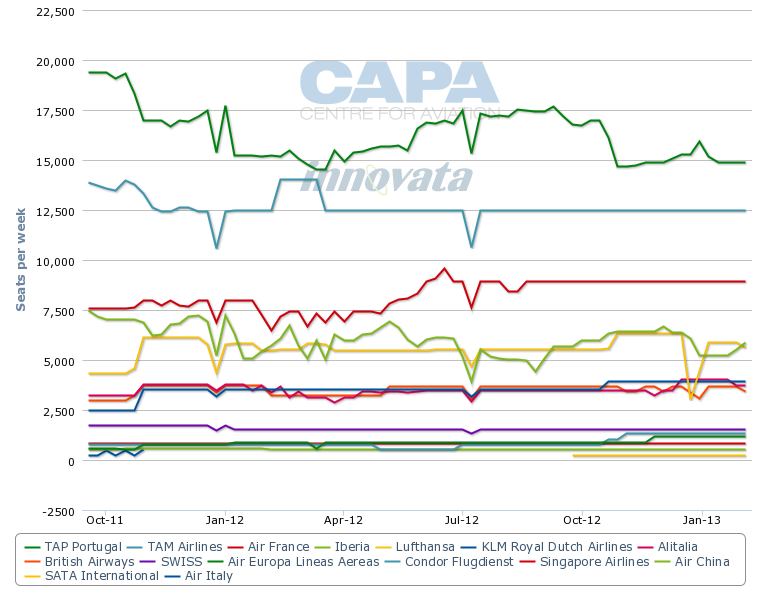 Iberia has a 17% seat capacity share and its Spanish competitor, Air Europa, holds a 10% share, based on schedules in Innovata for 20-Aug-2012 to 26-Aug-2012. Colombia’s Avianca, which merged with Central American airline group TACA in early 2010 and now is part of Avianca-TACA Holding, operates some 5300 one-way seats on routes from Colombia to Western Europe. 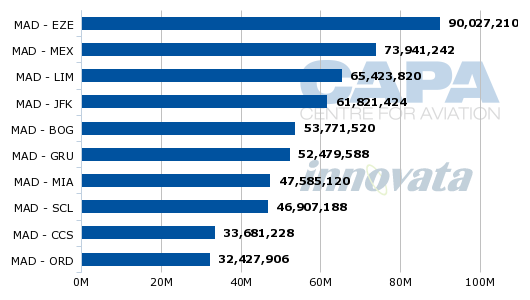 It has the largest capacity share, almost 44%, in this market. Iberia is the second largest operator between Colombia and Western Europe and has a 28% seat capacity share. Air France and Lufthansa hold a 16% and 13% share of seats capacity respectively. Between Venezuela to Western Europe, Iberia still offers the most capacity in terms of seats loaded in the GDSs for the week of 20-Aug-2012 to 26-Aug-2012. The airline holds a 20% share of seat capacity at present, but Lufthansa is closing in with a 19% share. Air Europa is offering about 2000 seats to Colombia and this gives it an 18% share of all one-way seats flown from the country to Western Europe. 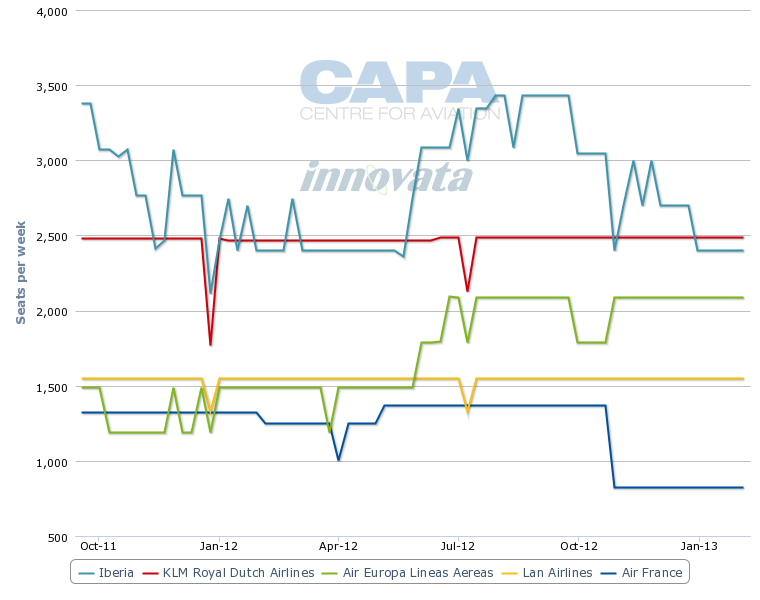 Air France has a 16% seat capacity share, Alitalia holds a 14% share of the weekly seat capacity and TAP 10%. Caracas is the only one of TAP's 11 Latin American destinations outside Brazil. The Peru-Western Europe market represents some 11,000 one-way weekly seats, according to current Innovata schedules. Iberia takes the lead with some 3400 seats and this gives it a 31% share. KLM is the second largest operator in terms of weekly seats offered between Peru and Western Europe and its Spanish SkyTeam partner Air Europa holds a 19% share. oneworld member and LATAM subsidiary Lan Airlines flies around 1500 one-seats in the Peru-Europe market, which gives it a 14% share. Iberia does not operate to Bolivia but it is the sole operator between Western Europe and Uruguay. Conversely, it has only an 8% share of the weekly seat capacity flown from Ecuador to Western Europe whereas KLM holds a 44% share of the capacity. This market represents roughly 3300 one-ways seats and Lan Airlines flies 47% of them, based on Innovata schedules for 20-Aug-2012 to 26-Aug-2012. Lan Airlines is also one of the three airlines operating between Chile and Western Europe. It produces 31% of the seat capacity is this market, on par with Air France. Iberia has the largest capacity share, 38%, with roughly 2300 one-way seats. European carriers noticeably control the traffic flows between Europe and Latin America, but Mr Walsh believes this might not last. “We haven't seen any big change but we're seeing the prospect of increased competition from Latin American carriers as they develop their brands and develop their business model,” Mr Walsh told analysts during the IAG 1H2012 results presentation, while admitting his “great admiration for the carriers there in Latin America”. Latin American based airlines will also benefit given the change in point of sale. “The growth is in Latin America and therefore the traditional mix between Europe point of sale and Latin American point of sale is going to change. That normally benefits the home carrier,” Mr Walsh asserted. The LAN group, for example, is now looking to open new routes in Europe, taking advantage of the synergies created by its recent merger with TAM. Europe will also be among the first routes for LAN's new Boeing 787 fleet. Chile-based Lan Airlines is slated to receive its first 787 on 31-Aug-2012, becoming the fourth operator of the aircraft and the first in Latin America. It will take delivery of 32 Dreamliners over the next 10 years. The 787 order represents an investment of USD3.5 billion. The destinations the Lan 787-8 will service during its first year of operations include two European gateways, namely Madrid in Spain and Frankfurt in Germany. Iberia, meanwhile, is seeing increased competition from its legacy counterparts. Both Air France and Lufthansa are restructuring to lower their cost base and are increasing capacity into the Latin American market. Air Europa, Iberia's home-based competitor, is also adding capacity in the Spain-Latin America market. Innovata data show that Iberia will be dropping about 1,000 one-ways seats in mid-October to Brazil, while Air France will be flying an additional 1360 seats on its routes from France to Brazil and Lufthansa will operate an additional 1180 seats per week on its flights from Germany to Brazil. 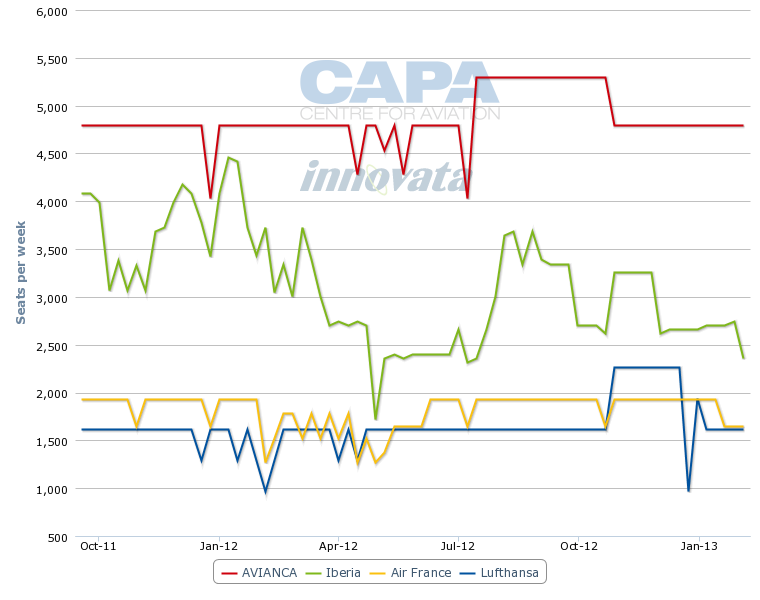 Iberia is keeping its capacity to Chile in the week 16-Oct-2011 to 22-Oct-2012 stable at the year-ago level whereas Air France will add 19% more seats. On routes from Argentina to Western Europe, Air France, Air Europa and KLM are adding seats and increasing their capacity share while Iberia is shrinking capacity. Management of Iberia's parent IAG is well aware the air travel landscape between Europe and Latin America is changing, which requires Iberia to take radical action to ensure the carrier sustains its long-term leadership position in the market.